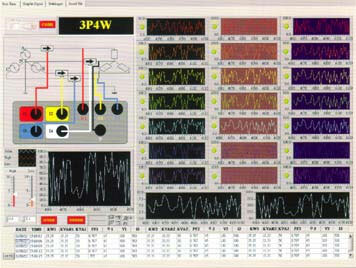 The PCE-360 power analyser is ideal for performing an analysis over a long period of time. It is a multifunctional meassuring device for analysing direct current, alternating current voltage and electric demand in watt. 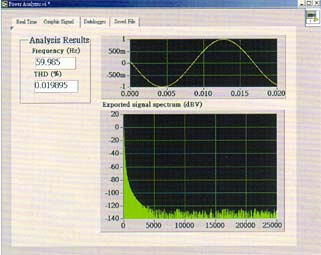 When the measuring results are negative a minus will appear on the display of the power analyser. When it is in normal mode the device is able to save 99 measuring results immediately but it possesses the opportunity of storing 20000 measuring results when the data logging mode is enabled. The PCE-360 is calibrated by the manufacturer before it is sent to the customer but it is also possible to get a calibration certificate by a specialized calibration laboratory later on. In addition to that a USB interface allows you to transfer the data from the instrument to your PC or laptop. this makes it possible to store the data in order to make use of it after some time. this is helpful when doing long-term measurements. 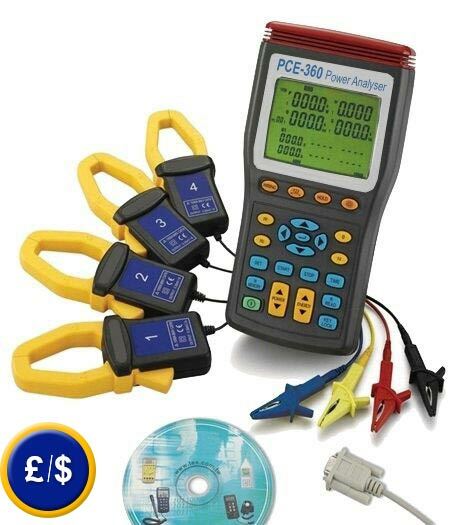 The power analyser comes with everything needed to measure and evaluate power, including software and the data cable. This link shows an overview of all power analysers we have available in our online shop. If you can't find the power analyser you are looking for, please contact us and we will help you find the best solution to suit your needs by calling our offices on: UK customers +44(0) 23 809 870 30 / US customers +1-410-387-7703 and our technical staff will advise you regarding our measuring instruments. Our engineers and technicians will be happy to help you with the power analysers, and of course, with the other products in the field of regulation and control, and scales and balances. 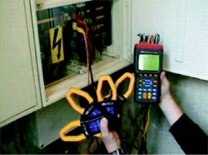 The PCE-360 power analyzer and the portable energy meter measuring an electric cupboard. As you can see in the adjoining image (right), clamps are very compact notwithstanding their great opening diameter. This allows the user to perform measurements in cables with a great diameter or in narrow places. - The ISO certificate includes a laboratory calibration and control certificate with all the readings.